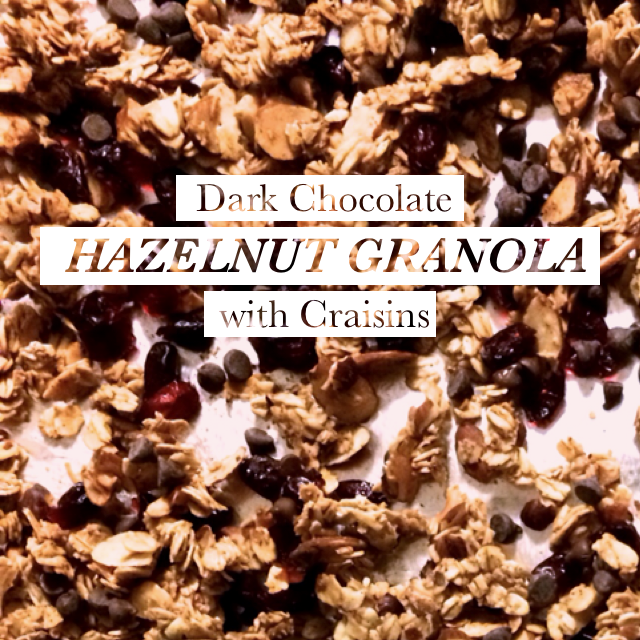 Dark Chocolate Hazelnut Granola with Craisins is the perfect easy and delicious snack. I’ve never made granola with hazelnuts before, but the hazelnuts came out wonderfully toasted; chopped walnuts also work quite well, and are usually my go-t0 nut to add in. The mini dark chocolate chips gives you just enough of your chocolate fix without being overwhelming. With some many options for nuts, dried fruit and spices, you can experiment with what works best with the season or for you. I made this last fall and have been hooked ever since. You can make the granola in bulk and be happily snacking for the rest of the week!